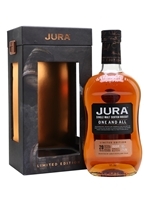 Released to celebrate Jura's community, this limited-edition single malt has been matured in almost as many cask types as there are people on the island*. Aged in bourbon as well as sherry, Cabernet Franc, Cabernet Sauvignon and Pinot Noir casks, this is an aromatic dram with notes of white chocolate, liquorice, toffee, ginger, maple syrup and fruit. *There are approximately 200. We may have been exaggerating, a little.